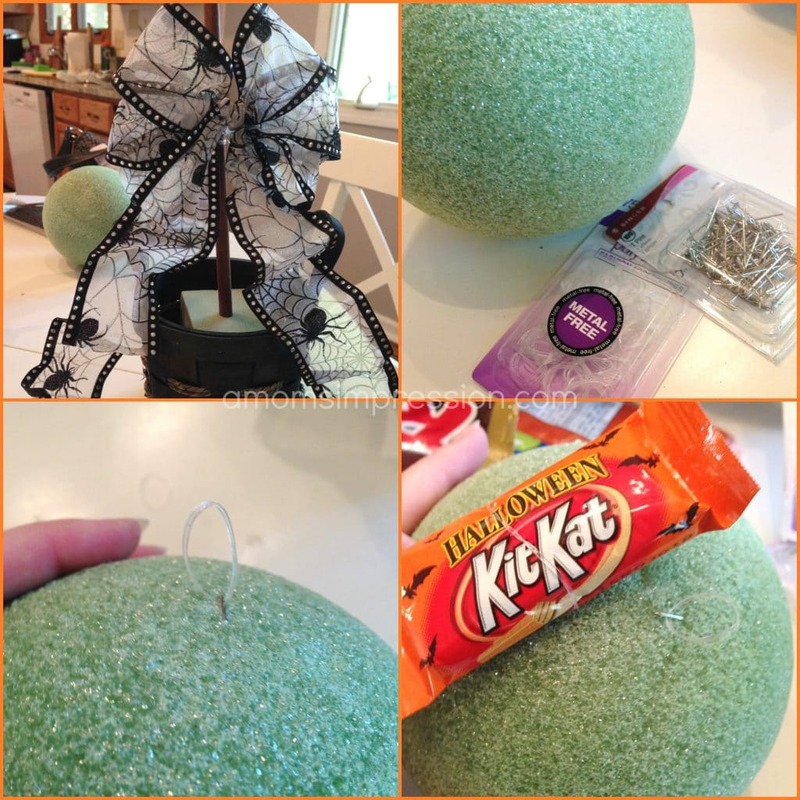 I love creating fun Halloween projects. This year we have a lot more space in which to decorate and enjoy for the holidays. SEeing as how Haloween is the first holiday that we have been in the house for, I wanted to really go all out. 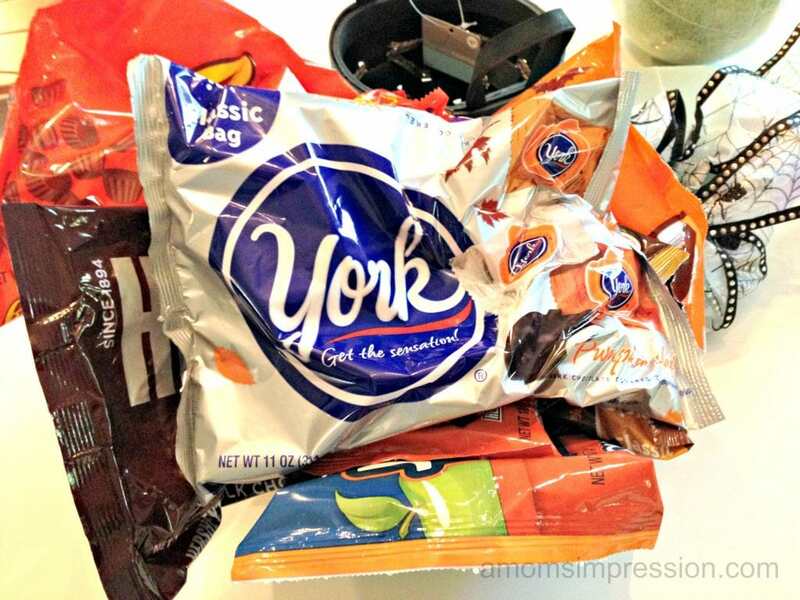 I mentioned before that my family will be coming over for trick-or-treating later this week. I thought that a festive centerpiece for the table would be appropriate. 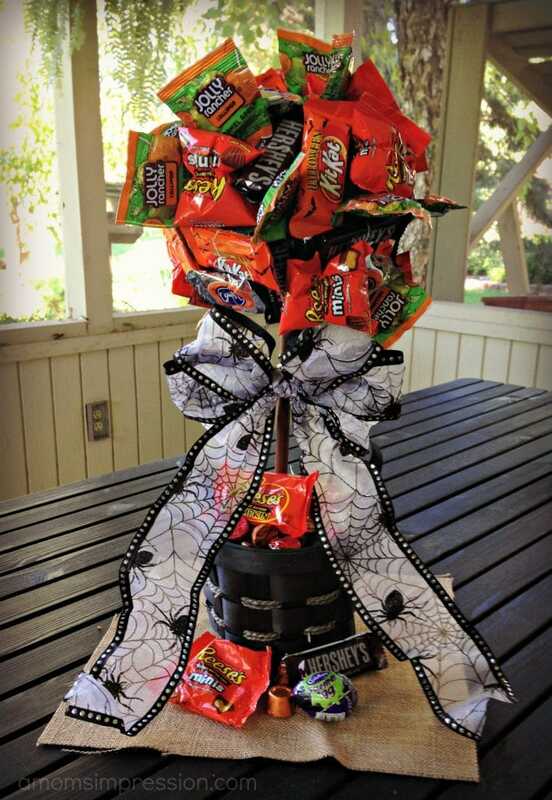 A DIY Halloween Candy Topiary idea came to mind and I started gathering supplies! Of course, I needed a lot of delicious candy! All of this Hershey’s candy ended up being just the right mix for my masterpiece. 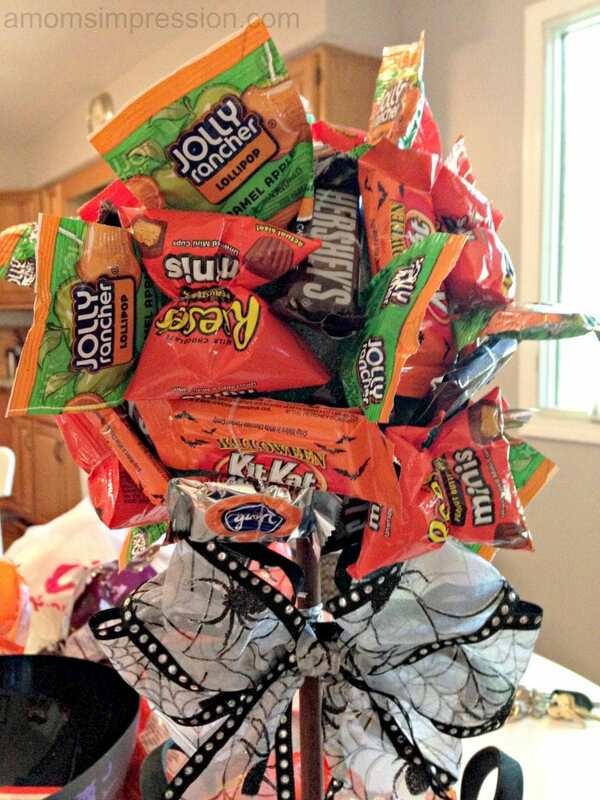 The mix of chocolate bars, York Patties as well as Jolly Rancher suckers where perfect to add Halloween colors to the topiary. 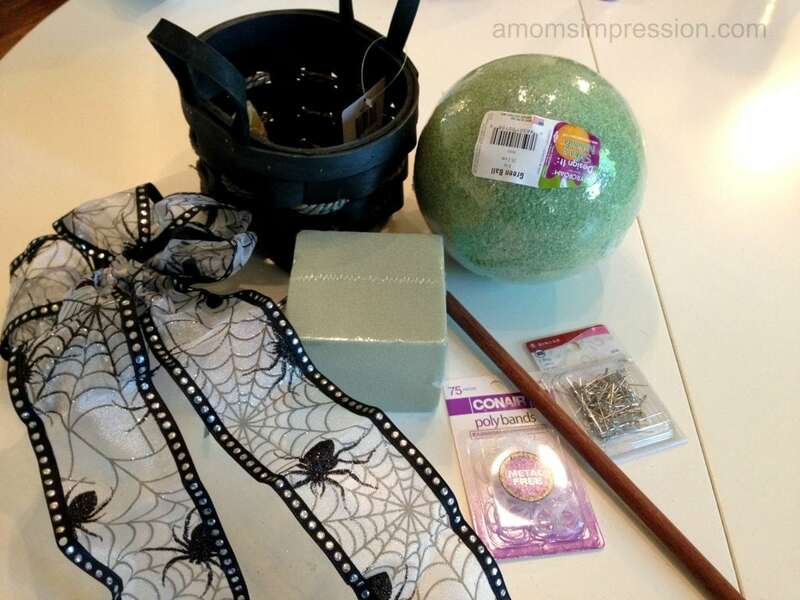 In addition to the Hershey’s candy, I gathered a green styrofoam ball (8 inch), a dowel a flower foam brick, a basket, a Halloween bow, t pins, and clear plastic bands. The first step I did was to create the base for my topiary. I hot glued the flower foam brick to the bottom of the basket. I then placed the dowel in the center of the foam pushing it most of the way down. I then added a festive bow. Next, I started feeding the plastic bands (you can find these in the hair care aisle. They are for toddler girls) through the t pins. 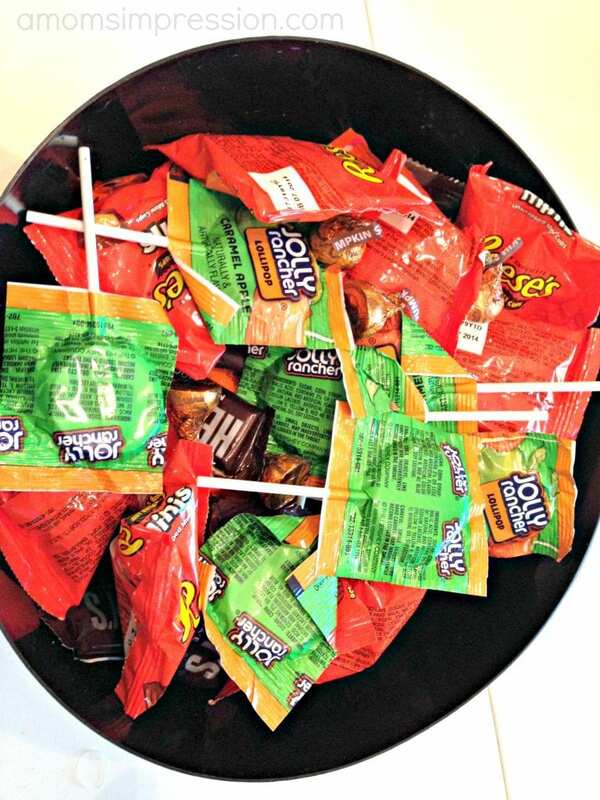 I attached the candy this way because I wanted to be able to give the candy away on Halloween. I didn’t feel comfortable pinning candy directly on the foam ball because I didn’t want to chance a pin getting stuck into the candy and getting into a young child’s candy bag. Safety first! These band worked great. After a bit of practice I found that it was much easier to put the band around the candy before putting it on the ball. Repeat this step until the entire ball is covered with candy. I filled in the empty spaces with the Jolly Rancher Suckers. I just simply stuck the sticks right into the ball. Finally, add the top of the topiary to the dowel. 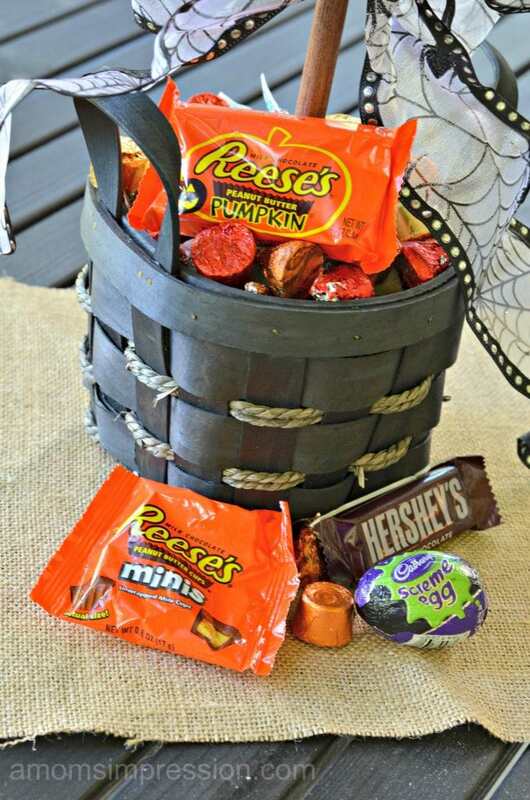 I filled in the empty spaces in the basket with some more candy both to stabilize it, and because it looked good. It just screams Halloween, doesn’t it? Yes, that is a Cadbury Screme Egg! It was delicious! Move over Easter, there is a new holiday egg in town! This little guy is going to be the star of the show this Thursday. I am hoping that the kids love it. I know they will enjoy all the Hershey’s Candy! 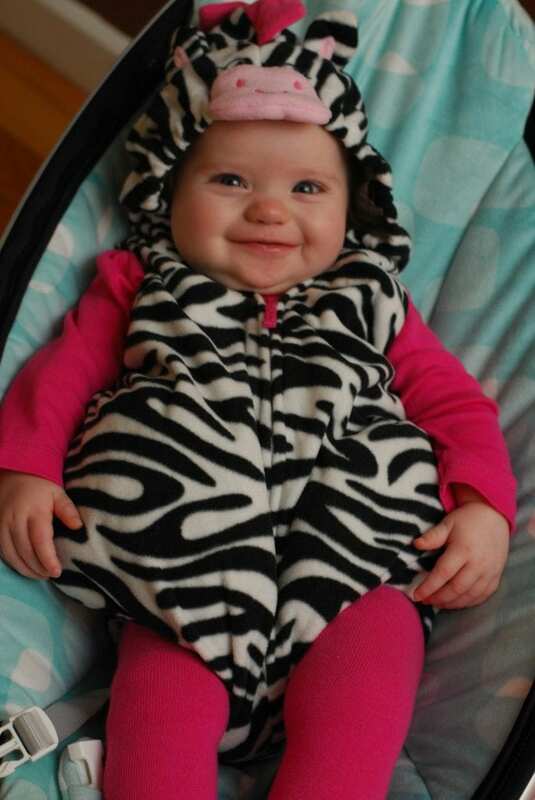 This little girl is excited for this week! Are you? What do you do to your home to get it ready for Halloween?